Canberra’s planners in the 1950s and beyond delivered an infrastructure made for cars. There were even major freeways planned (a story for another day). The road infrastructure till lately has been fairly successful and in turn has encouraged locals to use cars rather than public transport. Cars are part of most people’s daily lives. We might be killing the planet with this convenience but till another mode of powering the personal vehicle is totally introduced, the present carbon polluting thingies will be with us for a few years yet. And then there is the issue of parking lots. In many western cities, much heritage, greenery and open spaces were lost to the provision of parking lots. Luckily for Canberra it was a new city, so vast mounts of parking was provided without much cost to other needs. The bonus was that all this came with greenery in and around the parking lots. 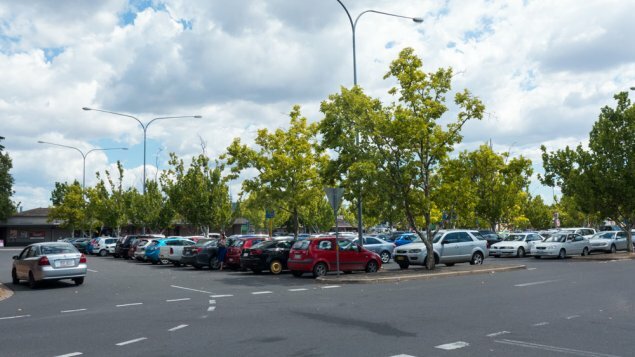 Till about a decade or two ago, there were heaps of these surface carparks, along with their trees, around the major centres, including the secondary group centres such as Curtin, Mawson, Jamieson, Weston and Dickson. Admittedly in more recent years some of those trees are not looking so healthy – but at least the original intentions were sound – sort of. Planners plan. Or at least that’s what they used to do. And Canberra up until the beginning of this century is evidence that this system worked. Well – most of the time. And then something happened. And to illustrate this change I find myself defending the parking lot. Amazing! These pre year-2000 parking lots are gradually being designated away from being surface carparks with their generous amounts of greenery to being classified as part of the government’s land banks to be sold off to very happy developers. And developers want bang for the buck – and so the end result on these sites is that there are very few trees. What used to be the role of the planners has largely been replaced by the government’s land development agency – the LDA/Directorate. Their dealings with residents have become a well-rehearsed process. First there comes the much-needed master plan for a shopping centre along with some agreed words that are spread amongst the media, such as ‘tired’, ‘neglected, under utilised’ and of course – lacking ‘vibrant’ spaces. Usually the arrival of the paid consultant to develop a master plan comes as a surprise to locals who did not know they needed a new planning document – as over the years there has been a host of neighbourhood plans and related planning committees. The next surprise is that this new but lacking any detail plan turns into a Trojan horse from which jump the bureaucrats with marvellous innovative schemes to sell the carparks – and other nearby community and parkland facilities. Why? So that there can be an abundance of vibrant new developments. Wow! If only the residents had thought of that! The more worrying is that the LDA/Directorate boys have encouraged a growth in very tall upright erect towers – being very vertical as well as vibrant! 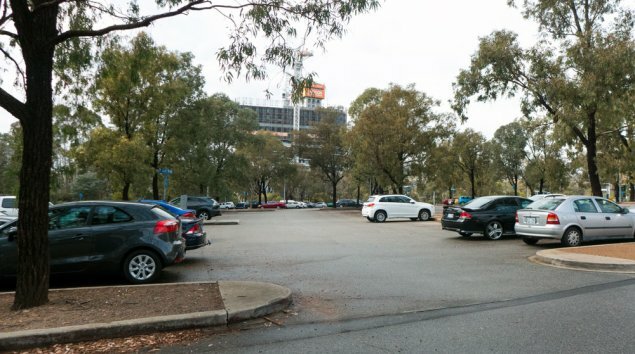 More seriously for anyone who appreciates the wonders of this city, is that slowly slowly – or should that be stealthily – as these carparks and nearby areas go under to be replaced with wall to wall vibrant edifices, the amount of greenery is being diminished. I suspect not many have noticed, but concurrently in many separate locations across significant areas of Canberra the urban forests are being thinned. As I said early, planners plan. 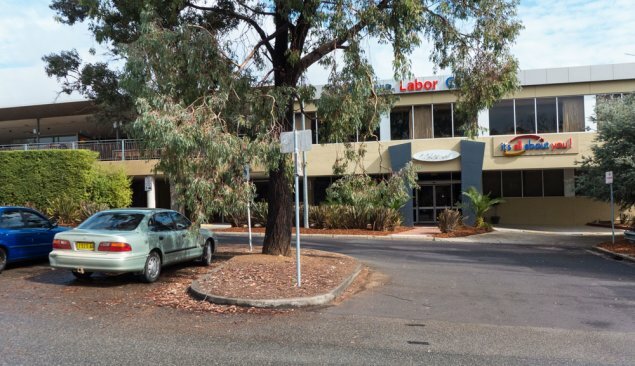 But unfortunately with the current rush on selling off the land banks (previously known as tree lined carparks) planners and environmental advisors are not engaged in the processes to ensure that when any of the greenery is removed that more is planted to compensate for the loss. The manner in which carparks are removed also varies depending on the neighbourhood. In Dickson the lazy approach was taken to simply sell of the plot of land and then to be seen to scratch around (unsuccessfully) to see how the present shop keepers may survive this major disruption. The only solution? Chop down some more trees. Of course! I am sure the owners of the Woolies store are not too happy to see the nearby carpark go under before a multi level parking structure was put in place to ensure minimal disruption over the next two to three years. This was indeed very possible given the size of the land sold and that a parking structure could have been built at one end before the new supermarket construction commenced. Hang on – did I just write words in support of Woolworths? OMG! Meanwhile in Belconnen when the carpark and an abundance of trees are to go under for a marvellous vibrant tall structure, for some reason the multi storey carpark will go up first well before the main building is commenced. Why here and not in Dickson? Someone suggested it could be something to do with having the Labor Club next door and their reliance on the car park for patrons. Surely it cannot be just that? So would I prefer the carparks to stay? Well yes. 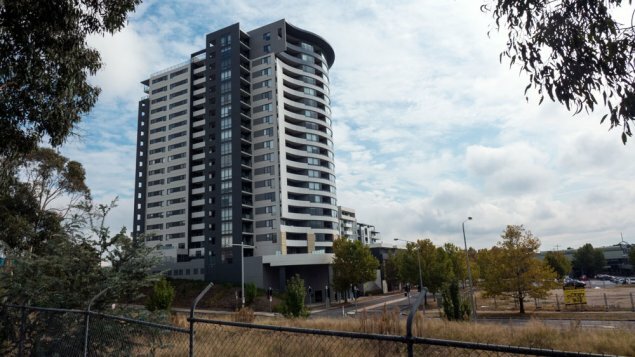 At least while the only option offered has been for more tall towers that please the developers and result in the subsequent huge loss of trees across Canberra. I sense we will soon lose that ‘Garden City’ badge. If anyone were to plan for far more appropriate developments and for the replacement of trees with even more, then there is a conversation that many people who embrace this city would just love to have. Maybe the new Environmental Commissioner, just appointed, should be looking into the situation whereby in the rush to erect more and more vibrant developments, the city is being subjected to a significant loss of greenery and associated biodiversity. Maybe she could examine how all these losses can be justified when the ACT Government boasts about how it is addressing climate change. Really? Neil Young loves his cars – Long May You Run (1976) – This a later version.